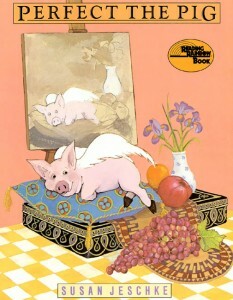 Before Granny Gomez and Jigsaw, vegetarian and vegan families had Susan Jeschke’s book Perfect the Pig. Celebrating porcine intelligence and the human-animal bond, Ms. Jeschke’s storybook also deals with animal cruelty and the problems that arise when we use animals for our own purposes rather than allow them to simply be who they are. As the runt of the litter, Perfect the Pig is ignored by his mother and the other pigs. Nonetheless, when a large sow falls over and cannot get up, he rescues her by helping her up. As a reward for his selflessness, the sow grants him a wish, and Perfect grows wings, which allow him to fly away. 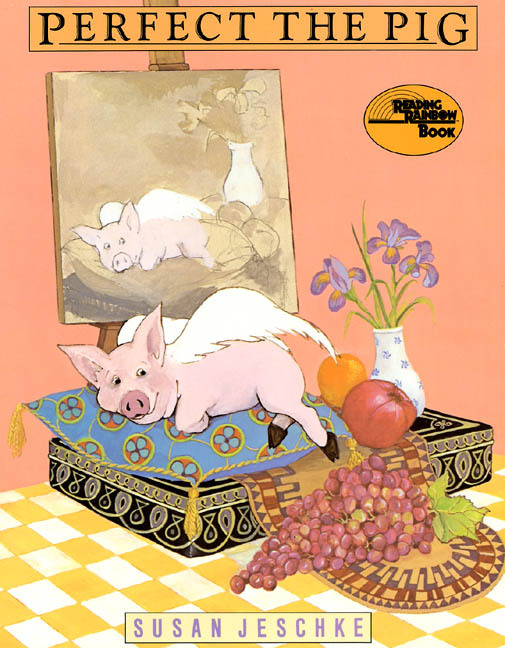 The winged piglet lands on the balcony of a woman named Olive, who feeds him, “then put[s] him to bed and kisse[s] him goodnight.” When the piglet kisses her back, she exclaims, “How perfect!” and decides to name him Perfect. Perfect’s life with Olive is idyllic. She cherishes him and does all she can to care for him and celebrate who he is, painting his portrait and lavishing him with love. Olive lives in a city apartment so she regularly brings Perfect to the roof to fly. On one of those occasions, he gets caught in a storm, which leads to his capture by a man who makes him perform, keeps him in a cage, and threatens him with violence. Happily, Olive eventually finds him and they move to the country. Vegetarian and vegan parents will appreciate Ms. Jeschke’s acknowledgment of the fate of most pigs without dwelling on the slaughter of animals. Olive’s attempts to protect Perfect, such as shielding him from seeing the dead pigs hanging in a storefront window, remind me of my own efforts to protect my daughter without being dishonest. People interested in animal rights will also appreciate that the disagreement between Olive and the man over Perfect is settled by a judge who allows the pig to choose. Ages 4 to 8. For a lesson plan keyed to the book, visit TeachKind. I was very happy when a friend asked if we wanted this book that she was getting rid of. It’s been on my list for a while. I love the story. However, it was a bit much for my sensitive daughter (3 years old) to handle. She started crying and saying “He’s not being very nice!” and “He’s going to eat the pig!” I think we may put it away for a while until she seems better able to handle the rougher aspects of the book. She did really like the pig’s relationship with Olive, especially when she gives him a bath and puts him to bed with kisses. Thanks for the feedback, JK. The villain in the story is AWFULLY mean and scary, and parents should be warned that he may be too much for young children. Still, the story is great when kids are ready for it. I am buying this for my (ex) step daughter. My recent ex and I have been vegan for almost 5 years. She turns 8 this month. The last thing we got to do together was take her to Vegetarian Summerfest for her first time (our 4&5th time). I think it really solidified veganism for the animals for her. I am excited to get this book for her. Sadly she has a blended family, most of which is not vegan or even supportive of it. This kid has always been so compassionate and loves animals. She has this new obsession with pigs to the point where she is bothered by ads with pig products in them – despite being exposed to it her whole life. I hope this is a pivotal point for her because soon she will be able to take more control over her own choices, and I am confident she will want to be completely vegan. I will definitely leave a comment once I give it to her. Thanks for leaving a comment, Amanda. I love Perfect the Pig, and I can’t wait to hear what you think of it. My kiddo is turning 8 in October, and I asked her if she had other recommendations for your (ex) step daughter. She recommended The Chicken Gave It to Me [http://vegbooks.org/index.php/2010/05/04/the-chicken-gave-it-to-me/]. Also, you may wish to check out the books tagged “Best Books for Vegetarian Kids” for more ideas. Thanks so much for the recommendations!! I definitely will. Since I helped raise Ana, I do want to still have a positive influence in her life. I absolutely love buying her books as I am basically the only one who does other than her dad. I love this site! Amanda, my kiddo’s birthday is the 31st, but mine is October 18! October is a big month for us — also my husband’s birthday, nephew’s, wedding anniversary, etc.